Since we know eachother for a while on saturday the 6th of december 2003 at 2:45:58pm it is the first time that I am chatting with my future love!!! Since then we chat every weekend and in that way we can learn eachother more. Unfortunately Warayuphat lives in Nakhon Pathom Thailand so I cannot go there "easy" for seeing eachother. In 2004 Warayuphat is in The Netherlands from the 19th of april till the 14th of july and in that time Warayuphat visit me to bring souvenir from Thailand and after we met a few time. 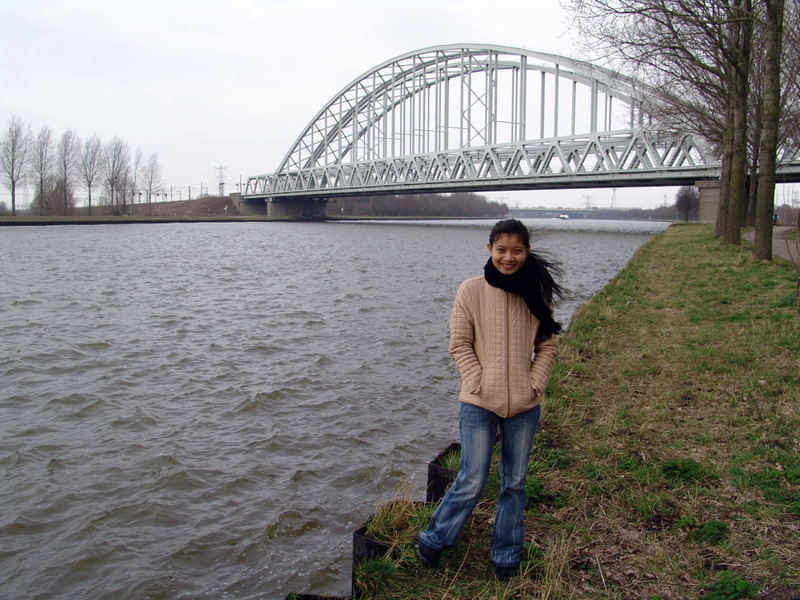 In 2005 Warayuphat is in The Netherlands from the 18th of january 2005 till the 17th of April 2005. In that period we learn eachother more and since then till now we have contact every day! Many times we meet somewhere, talk and drive to some places near Amsterdam. On the 6th of march 2005 we go to the "Haarlemmermeerse bos" which is beautifull white because of the snow. My uncle and aunt join us and we have a snowball fight, the cold of the snow is not bothering Warayuphat at all. Snow is normal for us but for Thai people which not see snow often it is very special. Trowing snowballs in the "Haarlemmermeerse bos". Nonglek and Nongyai in the snow. We cannot stop trowing snowballs. Ten day's later on wednesday the 16th of march 2005 the weather is nice and all snow is gone. Warayuphat and me are both free today in the afternoon. We meet and drive to somewhere, today we drive to the North of Amsterdam where we look at some boats. 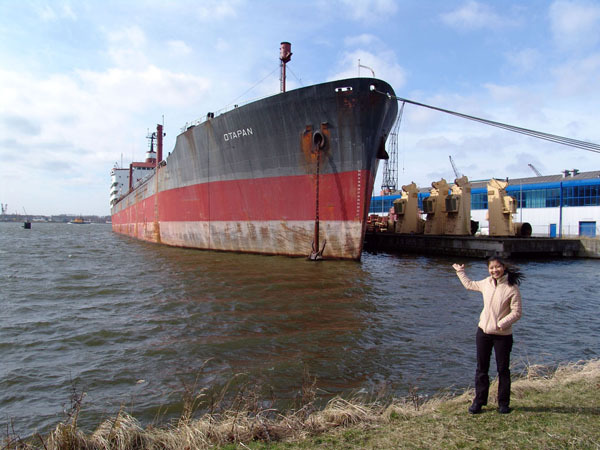 Ship "Otapan" te the north of Amsterdam. Most of the time we stay close to Amsterdam because my empolyer can call every moment but before that will happen we drive to Amsterdam IJburg where we take a look at the beach. On these moments we can learn eachother better and we start to feel more for eachother. I find it terrible when my employer is calling me for work because then I have to bring Warayuphat back to her place. Together on the beach at Amsterdam IJburg. Two day's later on the 18th of march 2005 we meet at the trainbridge of Diemen. Warayuphat with on the background the trainbridge close to Diemen. 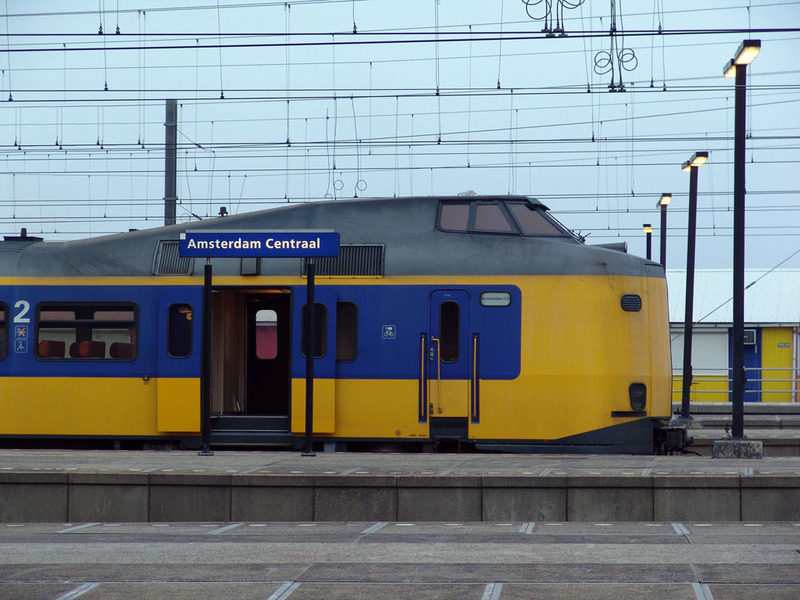 On friday the 25th of march 2005 I am going to Amsterdam CS after work because at 6pm a special train from Germany is coming to The Netherlands. I invited Warayuphat and she is coming towards Amsterdam CS. Around 8:30pm Warayuphat arrives at Amsterdam CS and we eat something at the Burger King where we have a view over the traintracks. At night we walk together to platform 13b where we hold tight we not wanna leave eachother that night!!! At track 13b at Amsterdam CS our relation starts!!! Platform 13b of Amsterdam CS is for us very special. 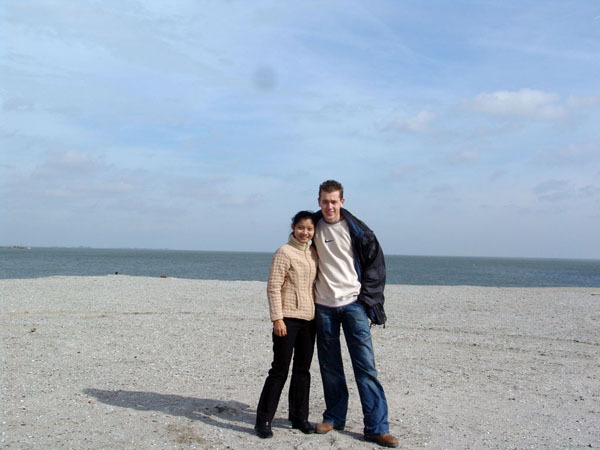 On friday the 15th of april 2005, two day's before Warayuphat have to go back to Thailand, I invite her to join me to Maastricht. We both like to travel and so we travel 1st class with the "Intercity" to Maastricht. Lovely to enjoy eachother in a driving train. In total the travel takes six hours from Hoofddorp to Maastricht and back but I find it to short!!! Nongyai and Nonglek next to locomotive 1836 at Maastricht. Warayuphat next to the 1st class coach in which we made our travel. Sunday the 17th of april 2005 Nonglek is going back to Thailand, the three month's have passed...a very sad time for me and Warayuphat. But we are sure that we wanna live together!! !